Throughout history, intricately woven tapestries have told romantic tales through rich textile embroidery that speaks louder than words. This fall, tapestry is fashion&apos;? ?s darling, showing up on runways at Valentino, Dolce & Gabbana and dozens more. Hip hub Fashionista.com named tapestry among the top 10 fall fashion trends. Style-conscious women everywhere are looking to work tapestry into their fall and winter wardrobes, and top stylists such as Rachel Zoe are offering tips galore on how to wear it (tip: less is more). 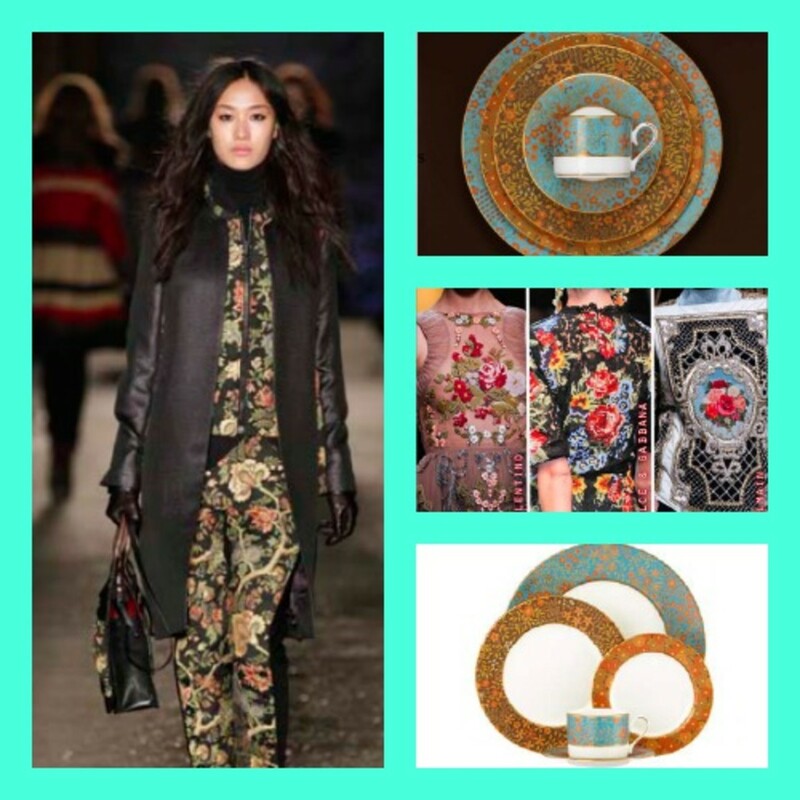 While sporting a touch of tapestry as part of a fashion ensemble might be tricky, incorporating this sumptuous look into fall and holiday home entertaining is simple, thanks to Gilded Tapestry. This color-rich floral pattern touched with gleaming copper and gold accents is from the L by Lenox collection, an affordable luxury collection of fine bone china made in the U.S.A. The extraordinary embellishment and sophisticated styling of the award-winning Gilded Tapestry pattern is a study in artistry. Lenox&apos;? ?s Vice President of Design, Timothy Carder, who also designed the official White House china collection, designed this luxurious floral motif. Beautifully detailed flowers, leaves and vines in warm, coppery autumnal hues are uplifted by fields of cool blue or anchored by background tones of deep, dark chocolate. All are embellished with burnished gold. Similar to tapestry-inspired fall fashion looks, this collection is designed for layering. Contrasting and varied patterns share common threads of color and metallic, so layering them together creates an extremely rich and sophisticated effect with zero guesswork about what might go with what. Changing the look of the table from one party to the next would be as simple as changing the color of napkins from bright turquoise to deep copper or espresso. Adding fall blossoms to the table setting (after all October is Lenox&apos;? ?s theme month &apos;? ?Love in Bloom&apos;?) such as sunflowers, dahlias, orange calla lilies, copper hued orchids or spider mums in tones of orange and gold will provide yet another layer of delicious drama. This pattern will also set off Thanksgiving dÃ©cor such as pumpkins and gourds, or a fall fruit bowl of pomegranates, persimmons and golden apples. For the ultimate layering effect: the host or hostess might incorporate a touch of tapestry into their outfit, bringing fashion and style together in a sweepingly romantic gesture. A five-piece place setting of L by Lenox Gilded Tapestry includes a dinner plate, salad plate, butter plate, cup and saucer. For a limited time, Lenox.com is offering a lovely rimmed soup/pasta bowl with the online purchase of each 5-piece setting. Statement pieces for entertaining include a coffee pot, creamer, sugar and a 13&apos;? oval platter. The collection is entirely dishwasher safe.